It was an amazing experience. The hotel staff is supper friendly, loved their whole decor, aesthetics and the location. I would certainly visit them again if I am in that area. Great overall experience. Nice rooms, good service. Nice hotel nice area restaurants galore . Our stay in was very pleasant and relaxing. Great historical place. Lots of character in the old hotel. Kept up very nicely. Loud evenings on perimeter rooms Saturday Sunday you are on the famous Whiskey Row. Interior rooms quiet. Great complimentary breakfast. Very old hotel. I believe they are making the best of what they have to work with. The staff are awesome and on point. Very pleasant stay. Nice place! Reasonably priced! Would definitely recommend it to everybody. Nice room and friendly staff. Breakfast was very good. This is a great place, and your dog is also welcome. Love this place!! Comfortable and great location. Front desk staff so sad nice. I have stayed here many times and will do so in the future. Prescott is snuggled up in the midst of the Prescott National Forest and has gracefully maintained its western heritage, as is evident in the local museums. It is called the "mile high" city, adorned with beautiful lakes and an almost perfect climate with mild seasons. Hotels in Prescott are known for their western hospitality and exceptional customer service. 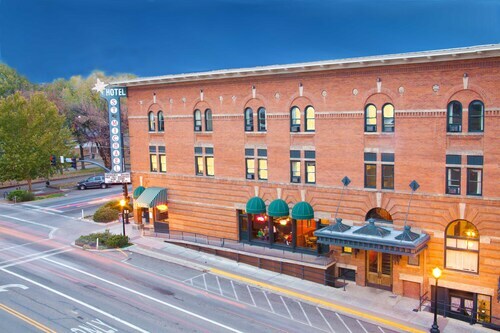 Prescott hotels know how to pamper their visitors with luxurious suites, bed and breakfast inns, and great budget rooms. Prescott hotels and the Prescott Resort and Conference Center can assist you in preparing for your next special event. Don't miss the downtown concerts starting September 4, 2012, which kicks off upcoming fall festivities. Built in the late 1800s, the Palace Restaurant and Saloonis the oldest restaurant and saloon in Arizona and a favorite hangout for visitors. The Earp brothers and Doc Holiday were regulars. Prescott's Courthouse Plaza is a very famous landmark – it was the nucleus for Prescott and remains a must see with art galleries, museums, old western boutiques, and specialty shops. The Prescott Gateway Mall has clothing stores, department stores, specialty shops, and restaurants. Amenities for shoppers include free Wi-Fi service, a food court, stroller rental, complimentary wheelchairs, and retailer coupons. Talk about an exciting sports team – the Arizona Sundogs gets everyone's adrenaline pumping. They are a professional hockey team and an affiliate of the Phoenix Coyotes. 1 week ago by A verified traveler from Peoria, Az.